Champion Communicator Deb Gangwish, Springview, Neb., recognizes that her story can make an impact, and in 2018, it did. Deb participated in a story “Grassroots Movement for Health Soil Spreads Among Farmers” with National Public Radio that helped propel the Soil Health Partnership into the national spotlight. ST. LOUIS – Dedicated leaders in soil health received "Seeds of Change" awards at the 2019 Soil Health Partnership Summit, Jan. 15-16 in St. Louis. These awards highlight those participants in the Soil Health Partnership who go above and beyond to promote soil health throughout the year. "The Soil Health Partnership's strength has its roots in our committed and supportive partners — especially the farmers and agronomists who play an important role in our ability to support research-based practices," said Shefali Mehta, executive director of the Soil Health Partnership. Champion Communicator: Deb Gangwish, Springview, Neb. Gangwish recognizes that her story can make an impact, and in 2018, it did. Deb participated in a story "Grassroots Movement for Health Soil Spreads Among Farmers" with National Public Radio that helped propel the Soil Health Partnership into the national spotlight. This story played a pivotal role in SHP achieving 1 billion media impressions in Fiscal Year 2018. 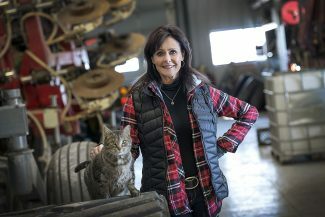 Gangwish has also placed articles in her local Nebraska newspaper, served as the first farmer-guest of the SHP's new podcast series, and continues to make herself available for media interviews. She believes passionately that farmers must tell their story to show how they are feeding the world sustainably and thoughtfully caring for the land.